Anna Peters, 88, of Brockton, passed away on Thursday, April 4, 2019. Anna was born in Taunton, MA to Jack and Bella Peters. She married George Peters and they shared nearly 60 years together. Anna was a Registered Nurse and practiced at the Brockton VA Medical Center for nearly 40 years. She was an avid cook who enjoyed experimenting with food and creating wonderful dishes to share with family and friends. Anna enjoyed music of the big band era and had a beautiful voice; she proudly sang in the choir at church. She and her husband, George, traveled extensively throughout the world and enjoyed summering at their home on Cape Cod with family. Anna was Albanian, Orthodox and was an active member of St George’s Cathedral in South Boston and the Daughter’s of Saint George. Ann is preceded in death by her parents and husband. Ann was proud of her family and devoted to their success and wellbeing. She will never be forgotten and forever missed. 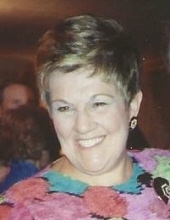 She is survived by her sons, Jeffery Peters and wife Amy Peters, Gregory Peters, daughter, Susan Severin and husband John Severin, her sisters Pam Ligor, Sophie Kolunie, Cynthia Files and her precious grandchildren, Courtney Peters, Cody Peters, Hannah Severin, Andrew Severin, Matthew Peters, Bella Peters, Nicolas Peters and great grandson, Wyatt Ramos. Visiting hours will be 5:00to 8:00PM on Thursday April 11th at the Russell & Pica Funeral Home, 165 Belmont St, (Rt.123) Brockton, MA. A funeral service will be held in the funeral home on Friday April 12th at 11:00AM. Father Arthur Liolin, of St George’s Cathedral, will officiate. Burial will follow at the Melrose Cemetery in Brockton. The family requests donations, in lieu in flowers, to St George’s Cathedral, South Boston in Ann’s memory. "Email Address" would like to share the life celebration of Anna J. (Peters) Peters. Click on the "link" to go to share a favorite memory or leave a condolence message for the family.